Recently, I've been pretty interested in card holders and money clips. What's not to like about them? They reduce the bulk in your pockets, keep you from carrying unnecessary things, and can help you keep your wallet in your front pocket, away from any imminent danger. 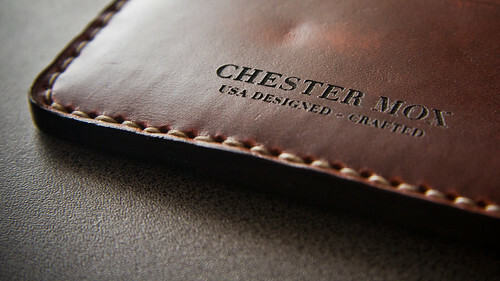 Anyhow, talking specifically about card holders, one company that has caught my eye is Chester Mox. I think the blog "Put This On" talks about this company quite often, but after checking through some of their products myself, I have to say that they have piqued my interest. Not only do they use some really fine leathers from Horween (the same guys who offer leather to Alden, C&J, Allen Edmonds, etc. ), but they also handcraft everything here in the states. The designs are simple yet elegant, the prices are not insane (though they aren't necessarily cheap), and you can even personalize them so that your name or initials can replace the Chester Mox logo! Personalization costs only $10, and their wallets start at around $39. They can go up in price to the hundreds, but one of my personal favorites is this gem at only $60. [Edit: Looks like they completely changed up their site and jacked up prices after I posted this. This one is similar to the one I was looking at before, but it's $65] These things can easily hold your cash, maybe 4-5 cards, and still remain compact enough for you to slip into your denim front pockets. I'm looking at getting one myself in the next couple days. Perhaps I'll follow up with a review if things go well (or poorly).